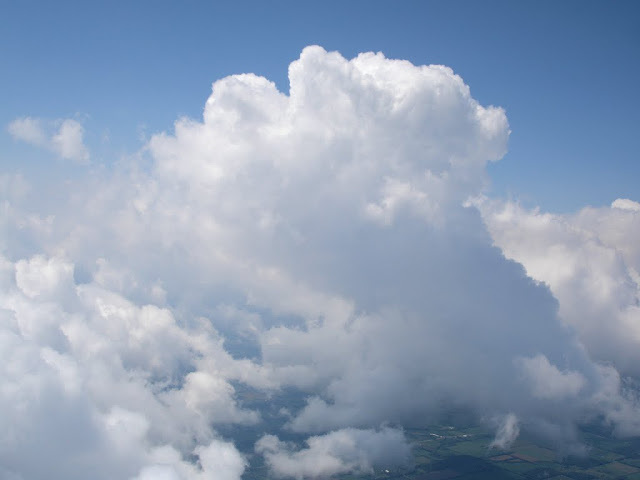 Three thousand and five hundred feet above sea level, I passed a cloud smaller than my airplane. As it whizzed past a wingtip, my Warrior was momentarily endowed with a facade of incredible velocity. With the cloud falling away behind me, the Warrior appeared to resume its methodical crawl eastward over the terrain of western New York. The engine purred smoothly with a gentle vibration that was transmitted to my hands from the controls. I was a part of the airplane. The air was smooth and the view off my right wingtip was of the Finger Lakes with their surrounding terrain still obscured by morning mist. It was a good day to fly and I felt a week's accumulated tension drain from my shoulders. My objective for the morning was a simple one: navigate to three unfamiliar airports and practice landing at each. The last landing of my previous flight nearly littered the runway of Le Roy with a breadcrumb trail of Piper parts leading back to my hangar. It was time to nip some bad habits in the bud. But I also love to explore and decided to satisfy both urges by choosing three unfamiliar airports whose names I hear on Unicom nearly every time I fly: Finger Lakes Regional (Seneca Falls, NY), Whitfords (Weedsport, NY), and Cortland (Cortland, NY). Of course the real reason I was cruising eastbound at 3500 feet was more sublime than any arbitrary mission. The mission was an excuse to put 36 gallons of $5.49/gal 100LL avgas in the tanks and ply the atmosphere with aluminum wings. My route east toward Syracuse was the exception rather than the rule that morning. Rochester Air Traffic Control was monitoring a veritable conga-line of aircraft bound for aviation Mecca: Airventure in Oshkosh, WI. In the words of the Rochester approach controller, "you would not believe the line of traffic I have heading out across Canada". Squinting into the morning sun, I followed my own course and progressed happily upstream. I saw a rectangular complex of buildings that were situated, quite literally, in the middle of nowhere. 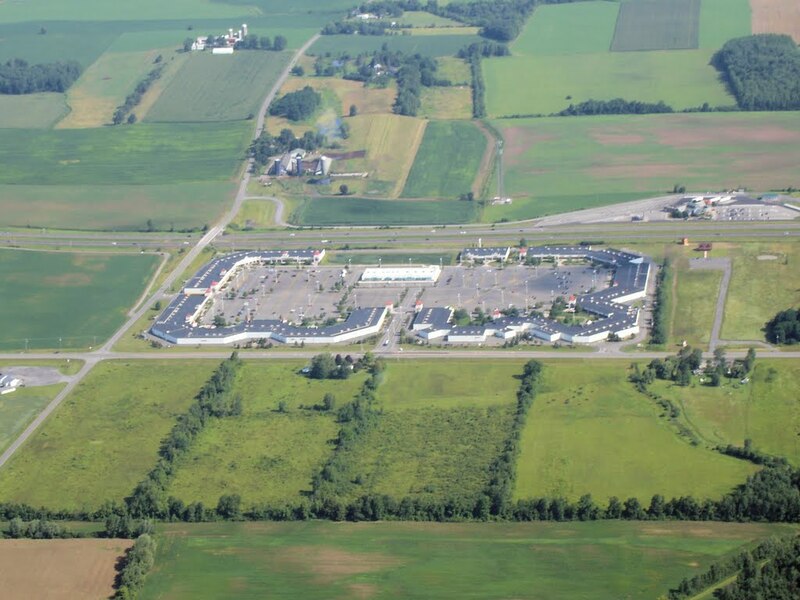 With a second glance, I recognized the site immediately: the outlet mall in Waterloo, NY. The complex was built like a strip mall drawn into a ring with all activity taking place within the perimeter. From within, this created an illusion of a bustling place of commerce. From above, the empty fields surrounding the place quickly dispelled the illusion. I wondered if the site had been purposely designed to create the impression of congestion and activity. Alternatively, all the facility needed was a portcullis (or two) and it was ready to withstand the rampages of barbarian hordes (I hear that Syracuse is a hotbed of Visigoth activity). As I crossed the northern tip of Seneca Lake, Cayuga Lake came into view. This meant that my first destination, Finger Lakes Regional, was nearby. I studied the sectional chart a bit closer, noting the position of the airport relative to nearby Seneca Falls and the curvature of the lakeshore. My approach was orthogonal to the north-south oriented runway, rendering it completely invisible from my position. Careful comparison of the chart to the living map spread out below helped locate a field of the correct shape in about the right location. By then, I had reached pattern altitude and announced my intentions to land on runway 1. 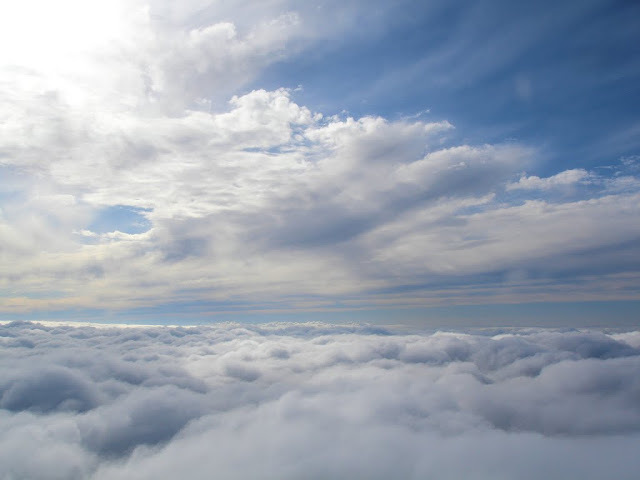 I pointed toward my best guess field and, within a couple of miles, was able to see the narrow strip of asphalt running across my path that validated my aeronautical intuition. I grinned. The days of being at a complete loss while my instructor played the, "I see the airport, do you see it yet?" game seemed long past. 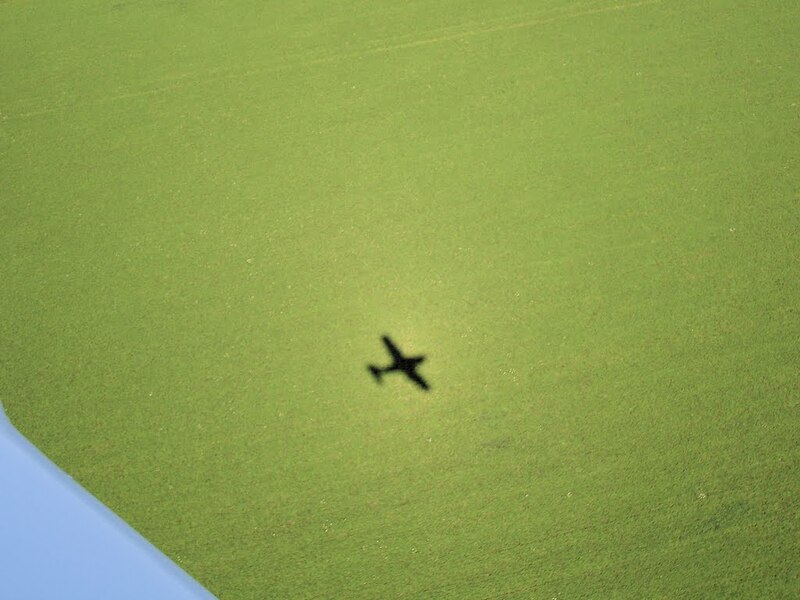 On short final, I was treated to the sight of my shadow flashing across the lush green landscape. And then, the runway. Closer, closer, pulling the nose up, up, up, stall warning horn going, and … THUMP. Firm. Not bad, but firm. I tried two more times. The other landings were also firm. Not terrible, just firm. After my final landing, a Cherokee 140 took the runway and began practicing landings as well. Perhaps it was my perspective, but his landings appeared to be more graceful than mine. I parked on the ramp and explored the airport grounds. A Piper Pawnee agricultural aircraft was loading up and preparing to depart. Otherwise, all was still. The terminal building was welcoming and nicely appointed, but empty. Within minutes, the airplane and I returned to the air. Our element. 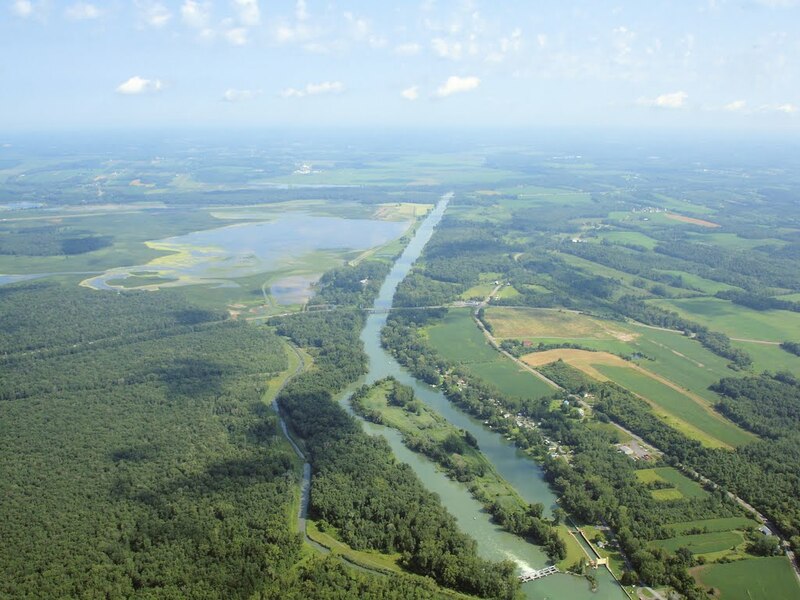 Our course was northeast across the Seneca River to Whitfords Airport. Though Whitfords is difficult to see from the south, its charted position relative to the town of Weedsport and the New York Throughway made it easy to infer its position. While at Finger Lakes Regional, I had overheard traffic at Whitfords. Now, all was quiet on frequency. The Warrior's wheels squeaked onto the pavement. A perfect landing. I taxied to the ramp and shut down. A menagerie of interesting aircraft dozed under the shade of wall-less T-hangars: a Cessna 120, a Taylorcraft, and a Citabria to name a few. A Bonanza was resting under an overhead milieu of compact discs suspended by fishing line; high technology repurposed as a low tech bird deterrent. Like Finger Lakes Regional, the terminal building was open, but deserted. Whitfords seemed like the sort of place that would be a safe harbor for the spirit of grassroots aviation, yet it was deserted on a beautiful Sunday morning. As I explored the quiet airport, I could not shake the sense that I was a thirtysomething dinosaur, still roaming the world after the extinction of his aeronautical brethren. Another Cherokee landed at Whitfords as I taxied for takeoff. Then I was aloft again in azure skies. I once described my first experience flying an airplane as physics singing to me. Every leap into the sky, every view of the earth falling away, recalls that song. I was a part of the airplane again. Whole. I paralleled the Finger Lakes en route to Cortland, the last of the three airports I meant to explore that morning. Climbing to 5500' to clear some scattered clouds, I saw the runway for Skaneateles Aerodrome below. I avoided Skaneateles because my flight planning that morning dredged up several warnings about potholes and overall poor runway condition. Even from 5500', the facility looked tired. Contemplating the apparent state of disrepair of the airport, I was struck by the same note of melancholy that had resonated in my heart as I explored Whitfords. That morning, both places seemed to be phantoms of a bygone era. After a short flight, I arrived at Cortland. A Cessna was waiting to depart runway 24 as I entered the pattern on a midfield crosswind. After my assurances that he had plenty of time to launch ahead of me, I watched him take the runway and start rolling. As he broke ground, he transmitted a warning to me about bird activity around the airport. On final approach, I was too high and eased the Warrior into a forward slip. As I turned the fuselage broadside into the relative wind, I peripherally noted the vertical speed indicator showing a rapid descent. Just above the runway, I straightened out and rolled the wheels on smoothly. The seagulls congregating along the runway centerline grudgingly gave way as I slowed to an appropriate taxi speed. My original plan included buying fuel at Cortland, which was advertised at $5.22/gal on the internet; a definite bargain in the current climate. Taxiing closer to the pump, I winced as I read "$5.50" on a handwritten sign. I had taken on more than enough fuel for the day's flying at Le Roy and, annoyed by the bait and switch, taxied past the pump and parked. On the ramp, I was presented with two large FBO facilities. Both were closed and locked. Nobody was around. With nothing else to do, I was soon on my way home. Once established in cruise flight at 8500 feet, I could not help but reflect on the state of general aviation. It was a gorgeous, VFR, Sunday morning. Though some airplanes were flying that morning, the airports themselves were deserted. There was a time when every one of those airports would have been bustling, aircraft slashing through the air as they approached and departed the runway. Perhaps some were not flying because their pilots were bound for Oshkosh. More likely, the airplanes dozing at each field were lethargic for want of expensive aviation fuel. And perhaps the skies were a little more open because of the dwindling number of pilots. Regardless, the notion that I was a dinosaur living beyond my era persisted. I looked down and noted an airport with a massive runway on the eastern edge of Seneca Lake. The chart indicated a closed airfield at that location. Looking more carefully at the facility below, it was obviously no longer an operational airport. Web research later revealed that it was the former Sampson / Seneca Air Force Base: another entrance to the sky closed for one reason or another. The Lycoming O-320 on the nose of my aircraft continued to purr and the instruments indicated that all was well. The controls were solid in my hands. In the distance was the city of Rochester and, beyond that, Lake Ontario. My heart was light as I directed my tiny craft through the sky, buoyed by an emotion that I cannot quite identify; as fleeting as the medium holding me aloft. Twenty eight miles away from Le Roy, I reduced power and the Warrior's nose dipped lower in order to stay in trim. Descending at 500 feet per minute, I arrived at my home airport right at pattern altitude. My home airport is often like those I had just visited. It is not uncommon for me to be the only living soul stirring there. Thus, I was pleasantly surprised to see something from the pattern that gave me hope: a new airplane being born. Dan had been building his RV-7 since before my arrival at Le Roy in November 2005. It was now sitting outside of Dan's hangar sans cowling or canopy. I landed on runway 28 and parked in front of my hangar. As I stopped the engine, I could hear the sound of another engine drawing closer. The RV emerged from the end of the row of T-hangars, circling the building in an earthbound victory loop while recording its first 0.1 hour on the Hobbs clock. After congratulating Dan on a successful first engine start, I returned to my hangar, alone with my airplane. I undertook the post-flight ritual of cleaning the wings and windshield of splattered insects. When finished, I patted the Warrior's cowling in thanks. I had logged 467 hours in Warrior 481 and, together, we had explored from Oklahoma to New Hampshire, Michigan to Florida, and many points in between. She had fueled my infatuation with things aeronautical for the last four years and still continued to do so. With a smile on my face, I lowered the bifold door, extinguished the light, and took my leave. I remained in a pensive mood for the drive home. Fuel costs were more than double of what they were in 2004 when I bought the airplane. Airports that once clamored with the roar of aircraft engines were quiet, or worse, abandoned. These things tempered the sense of satisfaction I had from my wonderful morning flight. But I'll be back: to touch the controls, to float through the sky, and to experience the unique lightness in my heart that only flight seems to inspire. For me, it's still worth it. The old saying is true: flying is freedom. Costly, over-regulated freedom perhaps, but freedom nonetheless. At winter's end, I found myself complaining about the poor weather than kept us on the ground for long stretches at a time. Rife with thunderstorms, July 2008 had a similar effect. 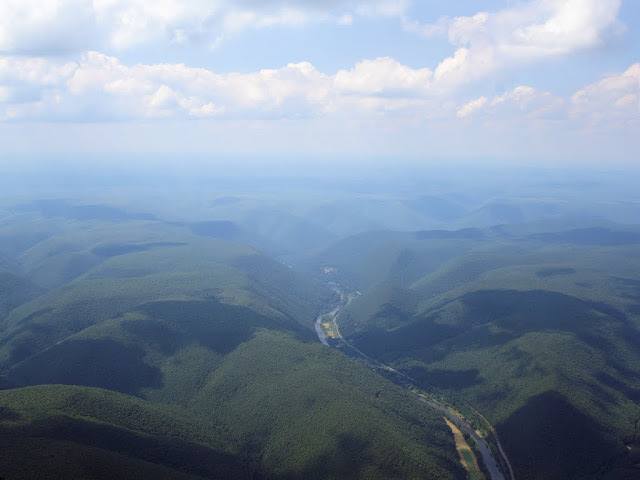 When the weather finally blossomed into a supremely gorgeous VFR day, we headed south to Pennsylvania. Our objective was Centre Hall, PA - home to Penn's Cave, purportedly the only cave in the United States that must be toured by boat. We last flew through northern Pennsylvania in February, our airplane's engine breathing deep of the clear, cold atmosphere. In summer, haze abounds, but the landscape has softened from the stark winter vision we beheld in February. We planned to stop at Lock Haven, PA for lunch. Ten miles out, we overheard "Snoopy Three" making a low pass at the Piper Memorial Airport in Lock Haven. When we announced our arrival at the airport, Ed Watson's voice came across the Unicom frequency to warn us of a blimp departing the airport to the west. Did he say blimp? 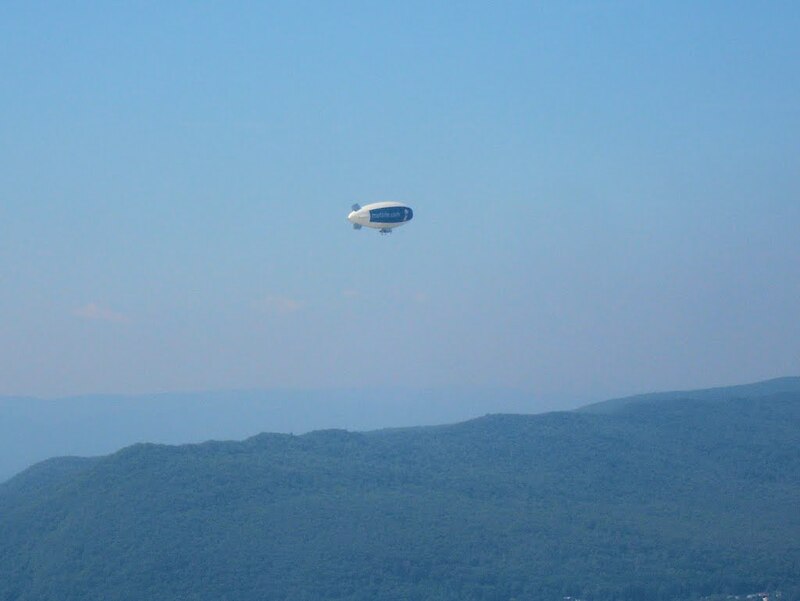 Sure enough, we soon spotted Met Life's "Snoopy Three" departing the area to the west. The blimp was surveying the field in anticipation of mooring there a few days later. The low pass must have been a sight to see and certainly slower than most. Ed drove us into town for lunch at Fox's Market House. 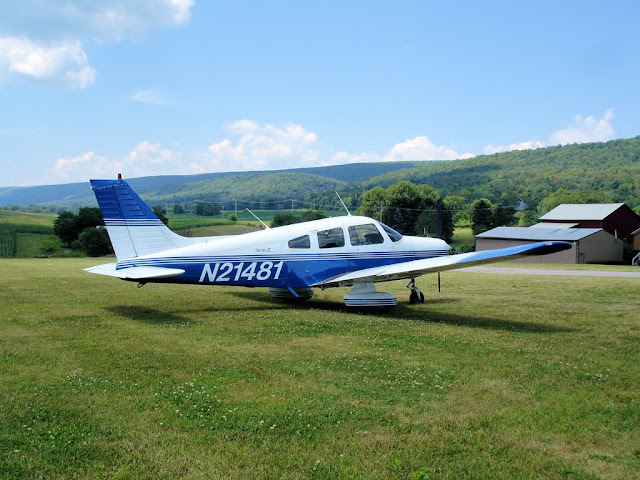 Piper Memorial ranks as one of my favorite airports - historically relevant, set like a gem between the Susquehanna River and the ridges of central Pennsylvania, and one of the most hospitable places a pilot could ever hope to land. Thanks again, Ed! Ed also receives bonus points for commenting on how shiny Warrior 481 is - this was her first flight since I invested about ten hours in washing and hand-waxing the airplane until my arms felt like they were going to fall off. Central Pennsylvania resembles a giant, ruffled potato chip. 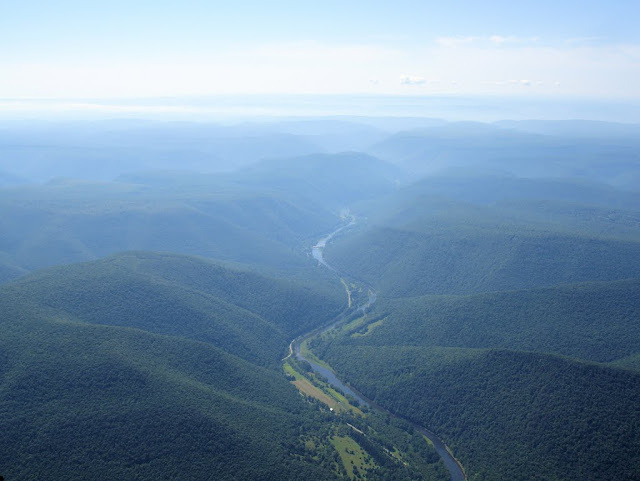 From our aerial vantage point above Lock Haven, the terrain is dominated by east-west ridges marching off into the midsummer haze. 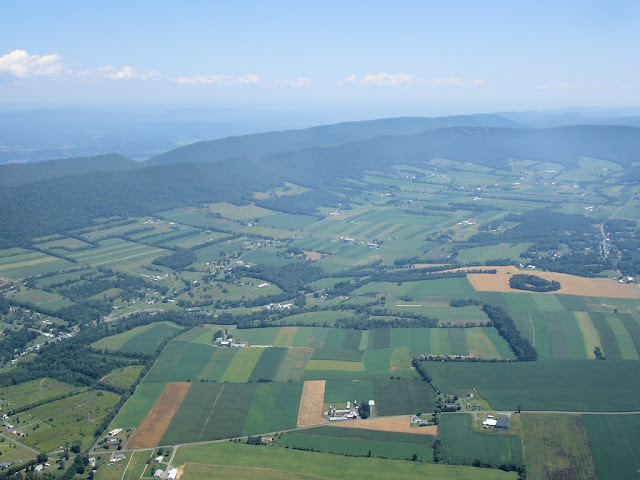 Between the ridges of central Pennsylvania lies a verdant patchwork of farm country. Each valley seems like its own self-contained world. 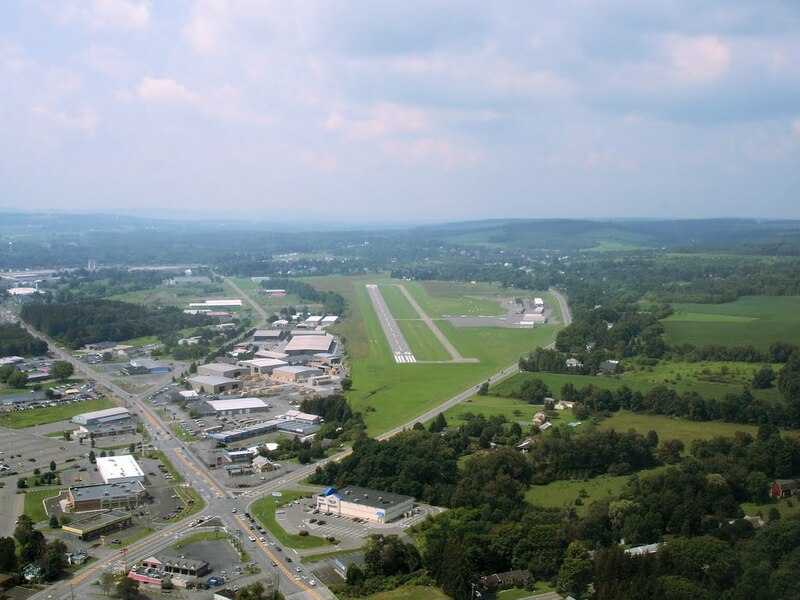 Thanks to Airnav.com, I was already aware of the short, sloping runway at Penn's Cave Airport (N74) in Centre Hall, PA. Despite this prior knowledge, the landing was not one of my best, though I think this had more to do with the downdraft I experienced on final than any upslope of the runway. Fortunately, I did not leave any Warrior parts on the pavement. We parked in this field for the afternoon, which gave some visitors to Penn's Cave Wildlife Park the opportunity to gawk at us during our preparations to depart. Penn's Cave is a short ten minute walk southwest of the airport. It's really dark inside Penn's Cave and my camera does not do well in low light, so here's a shot of the cave entrance from Lake Nittany as seen during the boat tour. The cruise through Penn's Cave lasted about 50 minutes and was very enjoyable. 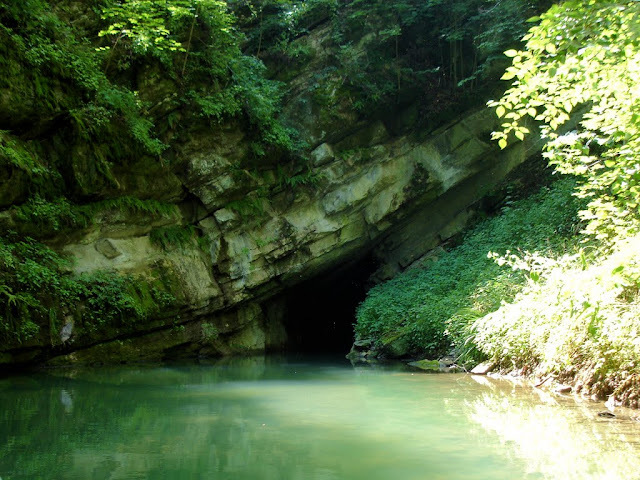 There is a lot of folklore surrounding Penn's Cave. One of the stories is of Malachi Boyer, a white man who fell in love with the Native American maiden Nita-Nee. Her brothers did not approve and trapped the Frenchman in Penn's Cave. When Boyer perished, the brothers weighed his corpse with stones and dumped the body in the deepest water of the cave (aboriginal Teamsters?). It is said that Boyer's anguished soul can still be heard whispering the name of his beloved, "Nita-Nee, Nita-Nee..." on the winds exiting the cave. The name later morphed into "Nittany", which is associated with the lion mascot for Penn State. On first thought, it may seem a little gruesome to link a team mascot with a heartbroken corpse wearing granite shoes at the bottom of a flooded cave. I suppose that if you're Penn State and you want to become the eleventh member of the Big Ten conference, you need any edge you can get. Consider the peer group: Wolverines (savagely fierce! ), Spartans (fiercely savage! ), and Hoosiers (um...corn fed). After a delightful voyage through Penn's Cave, we launched into the afternoon sky for the return home. 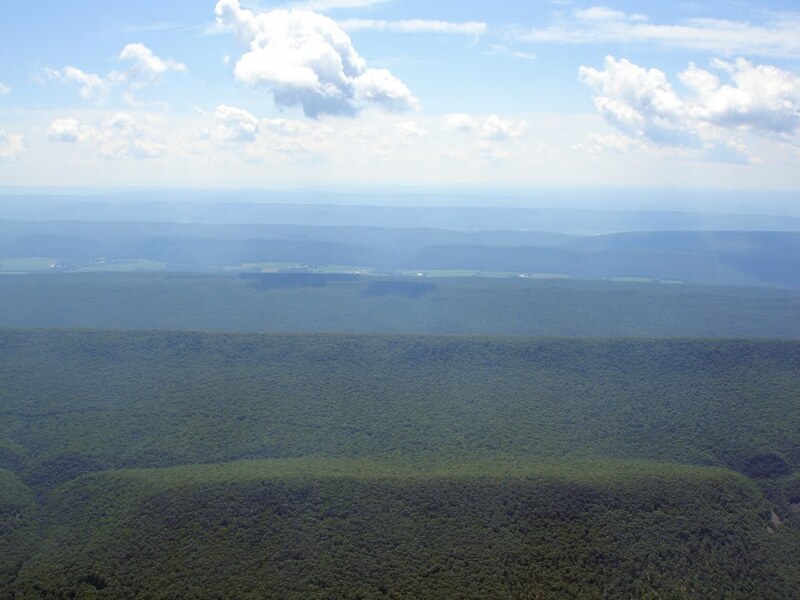 Pictured above is a typical scene from the flight north through Pennsylvania: clouds, haze, shadows, and terrain. After a year of talking about it, the morning of July 4 found us aloft in Warrior 481 on our way to visit Ann and Greg in central New Hampshire. I've known Greg since 5th grade and Ann almost as long - they are two of our favorite people in the entire world and a visit was long overdue. 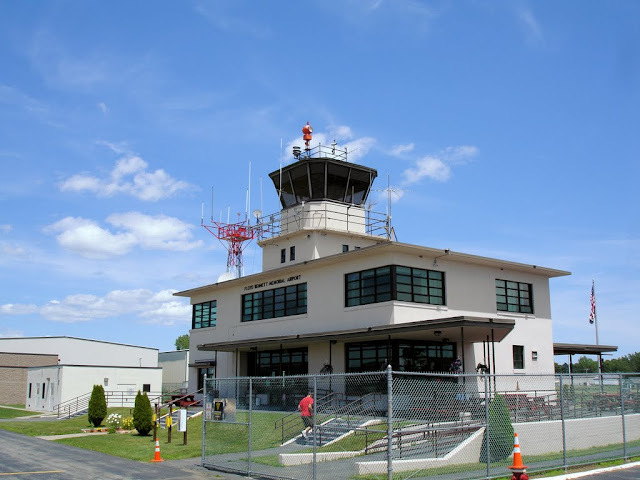 We passed over the southern Adirondacks and stopped for lunch at Floyd Bennett Memorial Airport in Glens Falls, NY (GFL). I did not think airports like this existed anymore. As we turned off the runway, Unicom queried us on our intentions and, upon hearing that we were stopping for lunch, directed us to convenient parking adjacent to the terminal building (pictured above from our parking spot). Rather than sitting behind a desk, the Unicom operator roamed the airport ramp area, directing arrivals to parking, fueling aircraft, and making small talk with transient pilots. Parked, we were surrounded by a diverse cross section of aviation. We were nose to nose with a jet that had just arrived from Dulles and next to a fabric-covered vintage Aeronca Champ. We learned that "Mike's Airport Cafe" had just reopened as "Carol and Tessie's Airport Cafe". Our server was Tessie, a well-humored grandmotherly type who accused The Bear of laughing at her throughout our lunch. Like Piper Memorial Airport in Lock Haven, PA we were overwhelmed by the friendly atmosphere at Glens Falls. 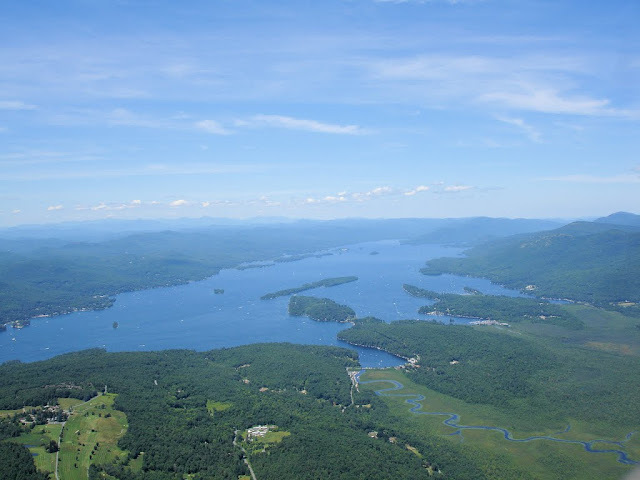 Scenic Lake George in eastern New York photographed immediately after departure from Glens Falls. 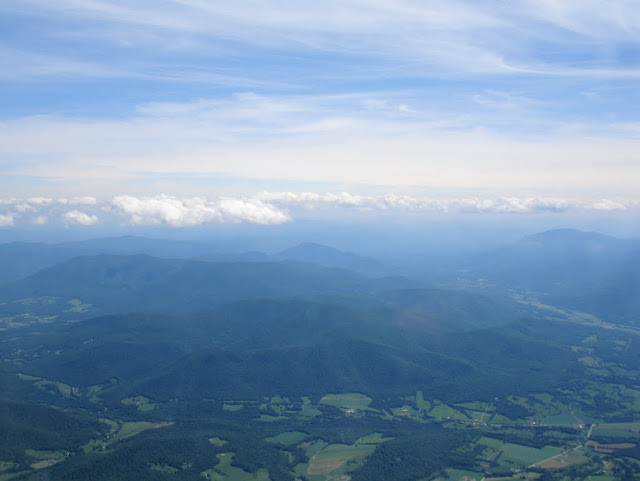 From 7500 feet over Vermont, the Green Mountains made for a lovely vista, but were not terribly impressive in stature. As we transitioned from the Adirondacks of New York to the Green Mountains of Vermont, the haze increased noticeably. 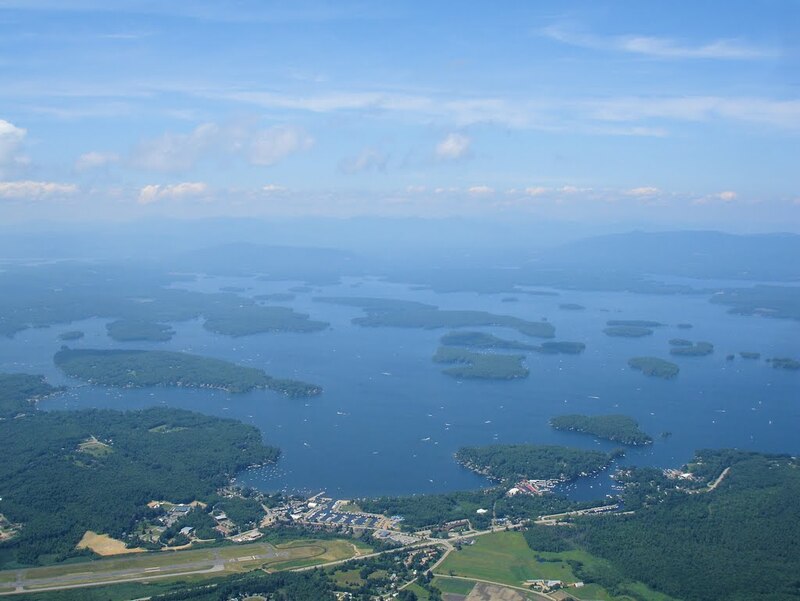 Our destination in Laconia, NH is adjacent to famous Lake Winnipesaukee. The view was grand, but New Hampshire was very hazy when we arrived. We had hoped that the view would be better when we departed the next day, but it was actually worse. A portion of the Laconia Municipal airport is visible at the lower left corner of frame. 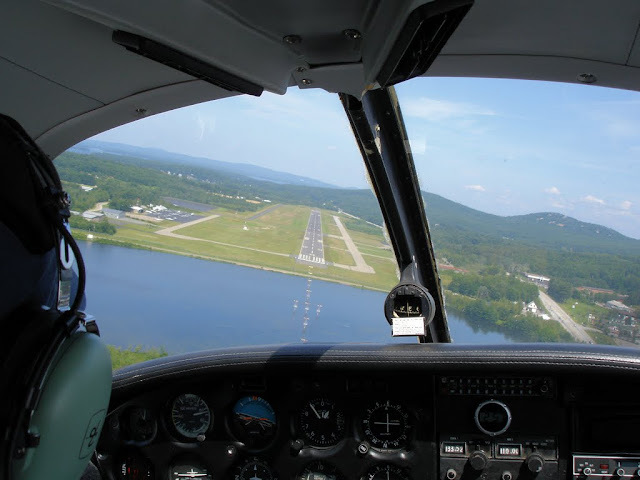 On final approach for Laconia Municipal Airport where Ann and Greg were waiting for us. Our landing at this airport marked our farthest aerial journey east to date. Photo by Kristy. Returning to New York from New Hampshire, we climbed to 10,500 to escape the dense haze and scuzzy cumulus over New Hampshire and Vermont. From time to time, we changed course to avoid build-ups like this one.